Alpha radiation consists o helium nuclei an is readily stappit bi a sheet o paper. Beta radiation, conseestin o electrons or positrons, is hautit bi an aluminum plate. Gamma radiation is stappit bi leid. Beta pairticles are heich-energy, heich-speed electrons or positrons emittit bi certaint teeps o radioactive nuclei sic as potassium-40. The beta pairticles emittit are a furm o ionisin radiation an aa kent as beta rays. The production o beta pairticles is termed beta decay. Thay are designatit bi the Greek letter beta (β). 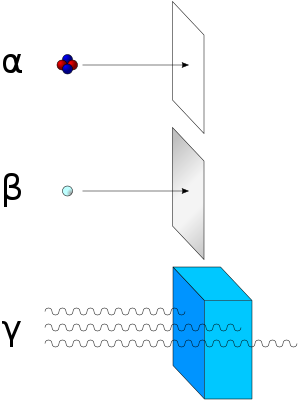 Thare are twa furms o beta decay, β− an β+, which respectively gie rise tae the electron an the positron. ↑ "Beta Decay". Lbl.gov. 9 August 2000. This page wis last eeditit on 16 Februar 2018, at 06:27.